It's Official: The Best Bosses Read TechCrunch! A young lady named Jennifer – the Internet is now hunting down her last name – sent a selection of thirty-three photos to her entire office of twenty people detailing why she’s quitting. Mostly it was because of a man named Spencer who called her a HPOA (go ahead and look it up or just look at the pictures) but you’ll note one important slide in her presentation. That’s right: Spencer was a TechCrunch reader! 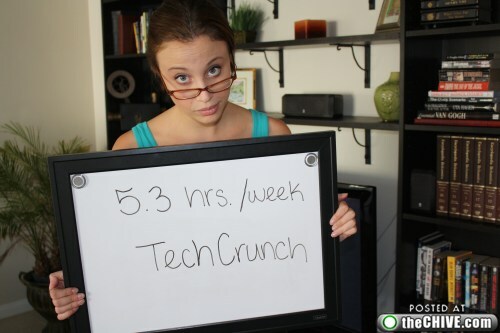 Spencer spent 5.3 hours on TechCrunch. That’s a good hour a day, every day. Take this as a “recommended dosage” and increase as necessary. Also, don’t be a Spencer. Also, hire this young lady. She seems to know her stuff, especially if she was thoughtful enough to spy on her own spiteful boss. UPDATE – The last word on the HOPA/HPOA debate comes from here and it can be spelled either way. Either way, incidentally, it’s also a horrible thing to say.